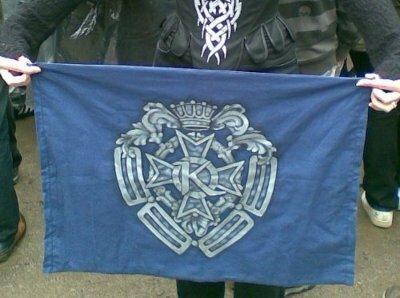 When I first began to think about this project, I wanted to make Kamelot's original, heraldic crest-logo, which I still like very much, but it would have been rather difficult to get to look right, I'm afraid, so I chose the Epica-era tribal logo instead. It turned out very nice, going well with the shape of the stays, especially when I added the tribals on the sides of the K-cross. The pattern for the corset was, unusually for me, a bought one, Butterick's "Making history" pattern for 18th century stays, which I ended up altering quite much. There is more about the pattern on the project page for my white stays. 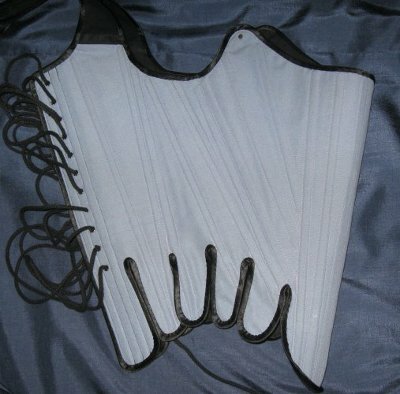 The foundation for the stays is two layers of stiff cotton, in which the channels for the bones are stitched. The boning is 7mm wide plastic cable tie, which I chose because it was cheap and as these stays are more decorative than stiff I thought it sufficient. It worked very well, actually, the only drawback being that they were quite thick and will show trough unless the top fabric is quite thick. My top fabric here is quite heavy, slightly shiny cotton, and the decoration is of blue satin and silver lurex. I am not very good in drawing, so I took the sharpest picture of the logo I could find on internet, and enlarged it. Then I copied it on film, which I cut to work as a sablon to help drawing the pieces on the wrong side of the fabric. I used the sablon again in placing the pieces on the fabric (which was backed with iron-on interfacing). I glued them very slightly, so that they would stay on their places while I stitched them on. I noticed pretty soon that I should have been more generous with the glue, because the elastic silver lurex was very elastic indeed, and also clung to the machine in a most irritating way. The finished appliqué is not quite perfect, because I couldn't stop for a minute until it was finished, so towards the end a few stitches went a bit wrong.N No, they are not visible to my critical eyes only, so far at least one other person has noticed them too. The rest of the making served as much needed practice for my real 18th century stays project. Among other things I learned that as sewing machine was a thing of the future at the time this type of garment was worn, its really designed to be made by hand, and cannot be rushed in a hurry with a machine - at least not all of it. A lot of cursing was heard when I tried to edge the waist tabs, trying to make as much of it with machine as possible, believing to save time by that, and only ending up sewing little and picking it up again. When it was time to fasten the other edge of the tape on the inner side of the stays, I gave up and made the lower edge by hand - which proved to be surprisingly fast. In the end the underside of the edging looks almost better than the other - but at least it's black on black, so it doesn't show that much. With the stays I made a wide-sleeved chiffon blouse, in the construction of which there is not much to report, it was mainly a case of a few elastic bands here and there, and irritating fraying edges. Since the waist tabs of the stays reached so high, I had not any pants with high enough waist, so I made capri pants with super high rise. Okay, a short top, tight capri pants and boots are not the most becoming outfit for my figure, but I decided this once to ignore the mirror. The capri pants eventually had the sad fate of stretching a bit on use and additional misfortune of my losing some weight (at least temporarily, and certainly not a bad thing save for the poor pants) caused them to fit very badly. I did not have the patience to try to save them so the new pictures on this site are taken with another pair of regular black pants on - they don't even show that much. After several club gigs I have seen Kamelot on some festival too. 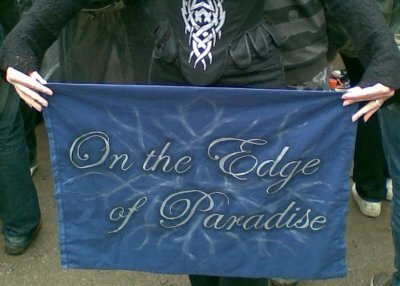 Though the festival gigs have a limited set list and less impressive light stunts, they have the advantage of a fine occasion for making a flag of your own - even though this time they would not let me in on the are with the poles, so I had to just hold the flag up on my hands. Anyway, flag was the perfect place for the older heraldic logo, which looked no doubt better painted than as an applique. I used the same concept as with my earlier Rammstein-flag, having the logo on one side of the flag and a piece of song lyrics on the other. The lyrics I chose are pretty obvious for the occasion, if slightly elaborate. 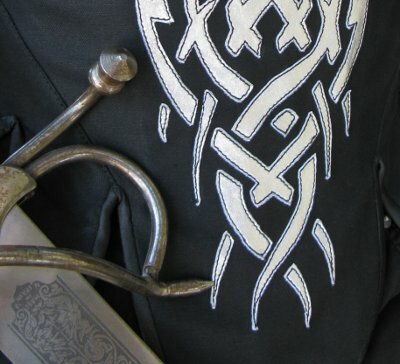 Again I enlarged the picture and made a sablon to sketch the lines of the crest, and then painted it with black and silver paint, and made the text side similarly. I had to finish the latter in a hurry on Friday night, going to all-day bachelorette party on Saturday. It shows, too, especially on the messy background. A bit pathetic, but I just had to put this too... A cute picture taken at the back door of a local club. An overjoyed little fan-girl of fourteen... okay, twenty-four, wears a silly smile. 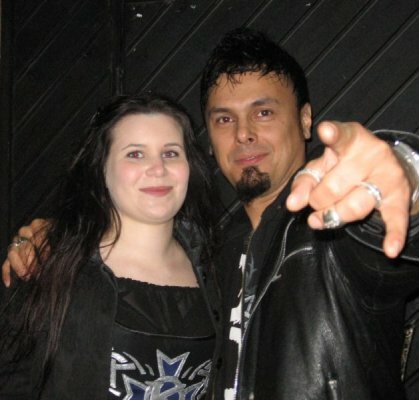 My thanks for the picture with Roy for the guy at Pakkahuone whose name I unfortunately don't remember anymore!